SOUTHPORT Football Club played their first friendly of the season on Tuesday 22. With Wigan being in the first division after being promoted at the end of last season, and having played several pre-season games already, the result was going to be predictable. Wigan was also helped by high attendance after interest was raised by their resent visit to Holland. 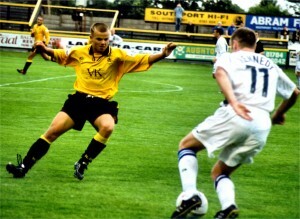 Southport new faces included goalkeeper Michael Bingham and Andy Whittaker. Wittaker is returning to the fold after several years. Wigan were predictably the faster and fitter team, as well as being more organised in the first half, going into the interval 2 - 0 ahead, but Southport on making several changes to the side made better progress in the second half. Southport started to play better, seeing them pick up in enthusiasm, but this did not stop the final result Southport 0 Wigan Athletic 3. Next stop for Southport be a clash with Skemersdale United at Burscough tonight (Saturday 26). Having gained experience from Wigan, Skemersdale should prove to be a different prospect and hopes of a good season are high in Unibond, which is winner takes all. FORMER spice Girl Melanie Chisholm is set to see a family role reversal in which her mother, Joan O'Neill, is to entertain Liverpool with her own brand of spice at the city council musical festival in Liverpool this weekend. Joan O'Neill will demonstrate that musical talent runs in the family on Sunday 27 July, with her Tina Turner Tribute band, River Deep at an event organised by the city council. The Croxteth Festival of Community Music, Arts and Culture is the brainchild of the Croxteth Community Trust. Sponsored by the Mersey Forest, it features many other local singers and bands, including Andrew Coleman - who shot to fame in the ITV1 programme Popstars. The grounds of the Edwardian Hall will come alive between midday and 5:00pm, with a whole host of cultural activities - including strolling artists, face painting, magicians and a funfair. Councillor Warren Bradley, Executive member for Leisure and Culture, said:- "Liverpool won European Capital of Culture 2008 because of the cultural talent which exists across the city. The Croxteth Festival of Community Music, Arts and Culture celebrates the very best local talent and is a great day out for all the family." MERSEYSIDE'S CRUMBLING architectural heritage is to receive a massive �1million pound boost from the region's development agency. An influx of cash provided the Northwest Development Agency to ensure some of the 63 most endangered listed buildings are made safe and preserved for future generations. English Heritage, NWDA and Liverpool City Council are working in partnership to preserve Liverpool's architectural gems a key element in the European City of Culture planning. The announcement arrives on the day English Heritage publishes its annual Buildings at Risk Register showing that across the North West, there are 162 buildings deemed "at risk" with 11 new additions and 11 removed from last year. The NWDA's decision to actively back Buildings at Risk through their commitment during the next 12 months for the protection of buildings currently under threat - reaffirming the value of Liverpool's historic environment. In Liverpool the Church of St James and The Albany are added to the BAR register this year to join a list which includes the Nelson Memorial in Exchange Flags, Liverpool, Fort Perch Rock, New Brighton, Ince Blundell Old Hall and Rainhill Hall Farmhouse. Aidan Manley of the Northwest Development Agency said:- "The Northwest Development Agency is proud to be supporting the 'Buildings at Risk' scheme which will facilitate the regeneration of Liverpool's most historic properties. This regeneration is key to improving the image and perception of the City, encouraging investment and therefore aiding future economic development. By securing the future of these buildings, the project will support Liverpool's bid for World Heritage Site status and will ensure that Liverpool maintains its reputation as a City of international historical significance." English Heritage Regional Director Malcolm Cooper added: "Our Liverpool project - Historic Environment of Liverpool Project was launched in 2002 to recognise the unique nature of city's architecture, heritage and in doing so, to safeguard it for future generations. The NWDA commitment represents a hugely significant contribution to the wider aims of the initiative. Our intention is to sustain this positive progress by developing strategies for buildings at risk in partnership with owners, local authorities and building preservation trusts. Though we have battled to secure the future of more than one in four of the buildings first placed on the Register in 1999, and given over �27 million nationally since that time, there remains a core of important historic assets that English Heritage simply has no resources to save." A new BBC2 series Restoration series, which will highlight the plight of threatened buildings featured in the latest English Heritage Buildings At Risk Register, is scheduled for a peak time slot beginning in early August.